Vogue Pattern Book, June-July 1937. Vogue ® V7689, Vogue ® V7690, Vogue ® V7669 Copyright © 1937 All rights reserved. Images courtesy of the McCall Pattern Company. In The Lost Art of Dress: The Women Who Once Made America Stylish, I was introduced to the idea that dressing used to be—and still can be!—a creative, inventive pursuit. Like we explore in other disciplines, fashion, style, and getting dressed everyday is yet another place for people to express their own inventive creativity. Whether it be picking a unique fabric to sew your own clothes or the choices that go into a unique outfit, the inventive spirit lives in the way we dress. Dr. Linda Przybyszewski, the author, very kindly answered a few questions to add her perspective as well. What motivated you to write The Lost Art of Dress: The Women Who Once Made America Stylish? Years ago I was in a used bookstore and I spotted an old college textbook from the 1950s called Clothes for You. It turned out to be 500 pages on the craft of sewing and the art of dress. I had never seen anything like it even though I am both a historian and a dressmaker, so I started looking for more such books. I ended up with over 700 publications. It turned out that dozens of textbooks had been written on the art of dress in the 20th Century and literally hundreds of pamphlets by home economists who specialized in textile and costume. Millions of American girls and women had read them in 4-H clothing clubs, and in junior high, high school and college classes. Radio programs featured their authors and women’s clubs had them out to speak. The art of dress was once a standard part of a woman’s education, but the youth culture of the 1960s dismissed it as retrograde and its lessons were forgotten. But America’s dress writers had offered a way of creating beauty in dress that holds true no matter what the current fashion happens to be. They knew that not everyone can afford a fine painting, or even find the time or money to visit a museum, but everyone has to get dressed in the morning, so clothing is the easiest way to bring beauty into our lives. They were America’s first and best fashion stylists and I wanted to bring their ideas to a new generation. What do you think is inventive or innovative about the idea of dressing? Dress design is the art of taking two-dimensional cloth and turning it into three-dimensional clothing that will fit on a living human body. It sounds simple, yet much invention happens while doing just that. My dress writers witnessed remarkable innovations from the early 20th century from the hour-glass figure to the loose silhouette of the 1920s to the martial look of the 1940s and the romantic, full-skirted look of the 1950s to the simple A-line of the 1960s. Looking through the pictures and patterns, I have been amazed at how many ways American women found to manipulate cloth into something wonderful. Even the housedresses of the 1930s featured clever details and graceful lines. 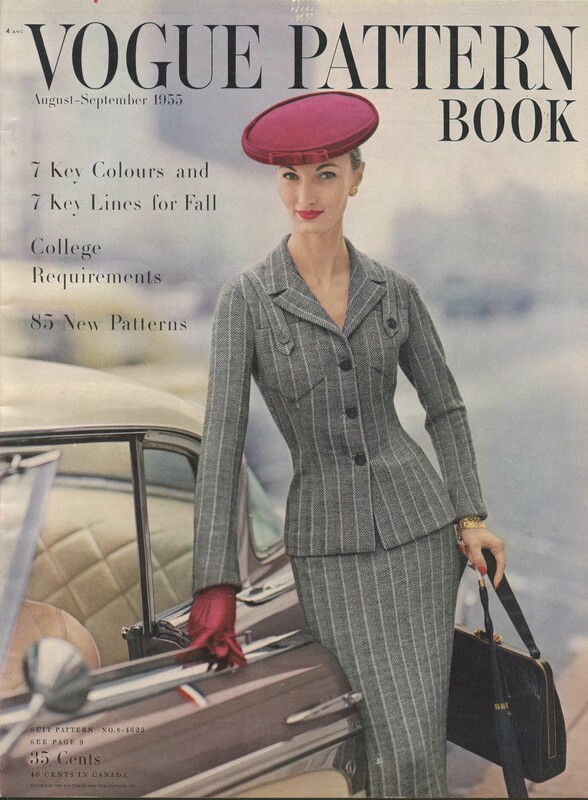 Vogue Pattern Book, August-September 1955). Vogue ® V4625 Copyright © 1955 All rights reserved. Image courtesy of the McCall Pattern Company. At the Lemelson Center, we often talk about how inventors put unrelated or unexpected materials together in unique ways in order to create innovative products. I see a parallel between that and the idea of putting together an outfit—what do you think? 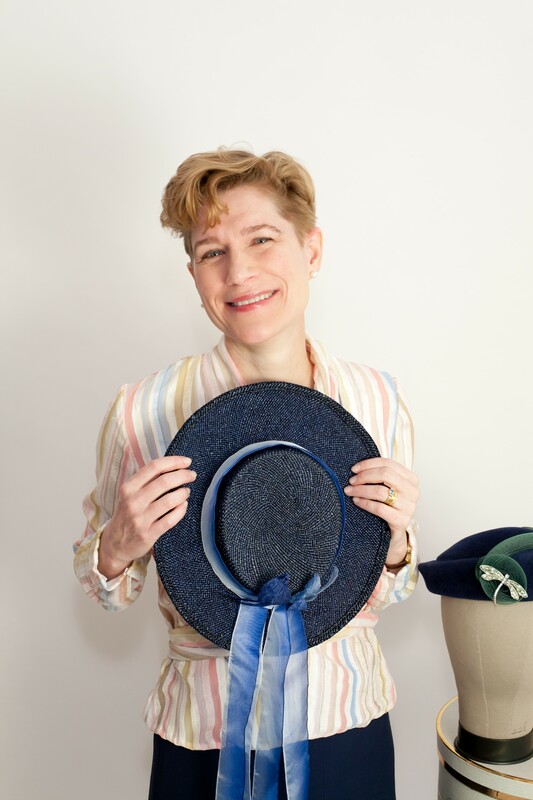 Harriet and Vetta Goldstein, sisters who taught at the University of Minnesota, wrote that even the store clerk who helps a woman to choose what to wear is creating a kind of art. The dress writers drew upon the art of composition from the fine arts; their innovation came in finding ways to apply the principles of art to clothing. This is why they said knowledge, not expense is the key to beauty in dress. As one of the decorative arts, the art of dress requires both beauty and utility to come into play. This is what the Goldstein sisters meant when they wrote of “the blessings of limitations”—when we put together an outfit, we must both apply the art principles and allow the human body to move freely and gracefully. I also see the blessing of limitations in the creativity in design forced by circumstances. American farm women with little money invented the feed-sack dress made out of the fabric saved from large sacks filled with chicken feed. Then, manufacturers of chicken feed realized what the women were doing and started putting out sacks in printed fabrics to compete for their business. During World War II, when so much fabric was needed for the war effort, booklets taught American women how to cut down a man’s suit to make a woman’s suit. As the old saying goes, necessity is the mother of invention. In your book, I was introduced to the idea of Dress Doctors, which I loved. Tell me a little more about them. I came up with the name the Dress Doctors after reading a story told in 1918 by Mary Brooks Picken, who became the leading American authority on sewing and dress, helped found the Costume Institute, which is now at the Metropolitan Museum of Art, and was the first female trustee of the Fashion Institute of Technology in New York. A woman doctor came to her and said, I don’t understand clothing, but I know I look awful, could you diagnose my case and prescribe me some clothes? So Picken examined her and came up with a new wardrobe, and the results were remarkable. Other doctors treated her with more respect, so did the nurses at the hospital, and people who had never bothered to consult her before now did. She was cured. Picken was one kind of Dress Doctor, these were independent business women who wrote books and ran their own sewing academies; other Dress Doctors were in the federal Bureau of Home Economics which had a division devoted to textiles and clothing; then there were the instructors at land-grant universities across the country who taught home economics and ran public outreach efforts called extension programs. If you could give someone advice on dressing in today’s society, what would it be? The Dress Doctors identified five principles of art to apply to dress, and I’ll explain just one—emphasis—because it’s the easiest to follow. Emphasis should be on your face, so people will listen to what you have to say and remember you. So the lines, details, and colors in an outfit should draw attention up to your face. The Dress Doctors also explained the different occasions for dress which range from school clothes all the way to formal evening wear, but the one important take away is this: spend your money and attention on the clothes you spend most of your life wearing. The clothes you wear everyday should bring beauty into your life. Timothy Westbrook's fashions weave cassette tape into shimmering new life. Sequins—whimsically employed—are what first drew me to artist Timothy Westbrook. A donation of Elphaba's costume from "Wicked" to the collections of the National Museum of American History prompts a look into the inventions and innovations that help make "Wicked" such an amazing spectacle. Historian Matthew Hersch explores the underpinnings of the space suit's development.